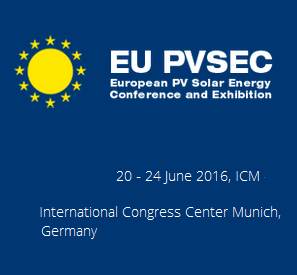 The 32nd European Photovoltaic Solar Energy Conference and Exhibition will take place in Munich, Germany on June 20-24, 2016. EU PVSEC - The Innovation Platform for the Global PV Solar Sector is the largest international Conference for Photovoltaic research, technologies and applications, and at the same time a top international PV Industry Exhibition. It gathers the global PV community to conduct business, to network and to present and discuss the latest developments and innovations in Photovoltaics. It is a world renowned science-to-science, business-to-business and science-to-industry platform focused exclusively on the global PV Solar sector. This event offers attendees an excellent opportunity to absorb, update and discuss the most recent and relevant developments in photovoltaics. The 2016 EU PVSEC provides a unique platform to present new R&D results and analysis, while also encouraging active participation of industry experts, analysts, and policy makers.